It is always awe-inspiring seeing young athletes showcase their talents. 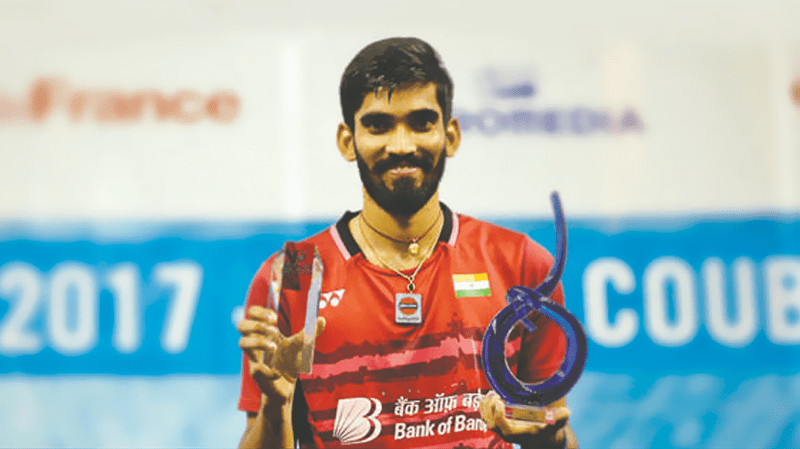 One such talent, Srikanth Nammalwar Kidambi, the rising superstar in the world of badminton has achieved great heights at an early age of 24. With a career record of almost 2:1 win-loss ratio, Srikanth now stands 2nd in the recently updated BWF world rankings. Clinching 4 super series titles- Australian Open, Indonesian Open, Denmark Open and the latest French Open in the year 2017, Srikanth is perhaps in the best form of his career. He is the first Indian and the 4th badminton player to win 4 titles in a year. He has also earned the highest Prize money in Badminton in the year 2017. Inspired by his elder brother K.Nandagopal who is also a Indian Badminton player rep-resenting India in doubles, Srikanth started playing badminton at a very early age under Sudhakar Reddy, his first coach. He was a doubles and mixed-doubles player till the age of 18-19 until his next coach Pullela Gopichand transformed him to a singles player which proved to be one of the most precious gifts to Indian badminton. Srikanth has won 9 titles in his caree at the international circuit till date. Currently, Srikanth’s badminton kit is sponsored by YONEX and Bank of Baroda is the main sponsor in a multi-year deal, although meagerly sponsored compared to the likes of Saina Nehwal or PV Sindhu. This arena of brand ambassador dominates male crick-eters, overshadowing the stars in the other sports of the nation. Srikanth’s current main focus is the Olympics Gold medal. In a recent interview, Srikanth confirmed that he will be playing 16-17 tourna-ments in a year, which includes the big events such as Olympics, Commonwealth Games, All England cup etc.